The cutest level-5 car on the road. 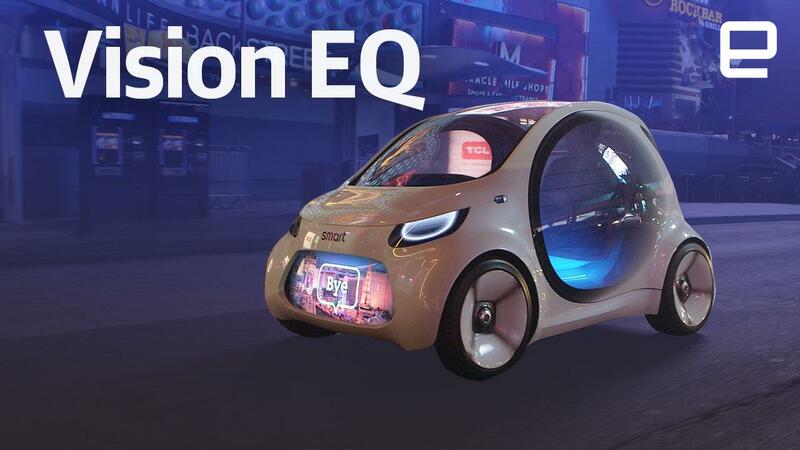 Introduced at the Frankfurt auto show in September, the Smart Vision EQ from Mercedes-Benz is the automaker's EV concept that combines mobility, autonomy and connectivity. The result is a car built on the Smart Fortwo platform, can wink at pedestrians, has level-five autonomy (no steering wheel or pedals), and welcomes passengers by name. It also took me for a short ride on the Las Vegas Strip. Mercedes says the concept vehicle isn't made to be sold to individuals and would instead be part of an autonomous ride-sharing fleet. The way Mercedes envisions a car like this would work is that it would arrive at a location and display the name of the individual that hailed the ride on the front of the car. They would enter the vehicle, and the dash would show their name, photo and other information they shared with the car-share service. Then the electrical vehicle would cruise autonomously around and eventually drop you at your location and bid you farewell. One interesting feature is that the car is outfitted with hand-sanitizer dispensers, so as the passenger departs, they can clean their hands after being in a car that's been on the road all day with various people getting in and out. My ride in the car was a bit less personalized. Mercedes did update the front display with the Las Vegas Strip, but it was set to the default demo passenger. No biggie, the point of the short drive (about 500 meters done twice) was to experience the sensation of being in a level-five car that could be the blueprint of a future Mercedes. Even though the two passes I took in the car lasted about five minutes, and the car was controlled by a Mercedes technician via a remote, it was a good indicator of how it would feel to sit in a car you've hailed without a human behind the wheel. If this service were available now (and was safe), I would use it all the time. Parking in San Francisco is challenging even on the best of days, and I like the idea of a car that winks at people as it drives down the road. I'm guessing that other folks tired of traffic and spending 20 minutes looking for parking would too.